LEARN ABOUT HORSES: from clydesdales to westphalians through visual recognition. FUN MULTIPLE CHOICE QUIZ format tracks your progress as you go. The app keeps you challenged by remembering what you got right and wrong! BROWSE EACH BREED'S HISTORY to learn even more! AMAZING PICTURES of horses that inspire learning. 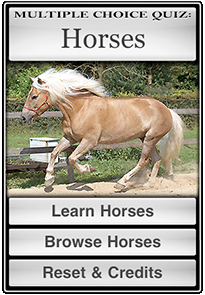 There is no better or easier way to introduce yourself to so many equine breeds! You won't want to put it down once you start! - LOTS OF FUN! And you're learning!